Words simply cannot express the extent of the sickness, wickedness, and heartbreak of today’s tragedy. 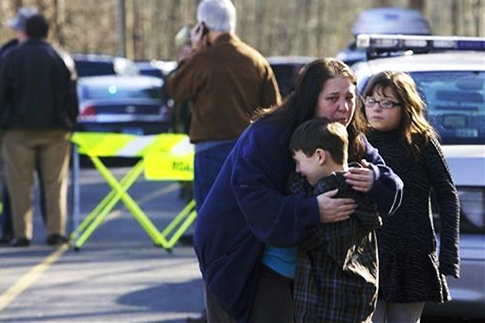 Early this morning a man entered into Sandy Hook Elementary School in Newtown, Connecticut. He proceeded to unload many rounds on innocent children as they cowered in corners and closets. There are 27 known dead, 20 of which are children. Among many other questions, one that inevitably comes up in this kind of situation is, “How could God allow something like this to happen? Especially to the most innocent of all people on the earth, to children?” Here are some answers from Scripture. 1. “God causes His sun to rise on the evil and the good, and sends rain on the righteous and the unrighteous” (Matthew 5:45). Whether we like it or not, God has never prevented all evil from happening, nor has He always brought immediate punishment on the wicked. God has also never promised that life will be without problems and tragedies. Since these aspects are true, we should never resort to anger and blame towards God. In fact, Job’s friends were punished for having such attitudes (Job 42:7). God has always given people the freedom of choice, despite the terrible sins and even the killing of His own Son that came as a result. God is not to blame, sinful people are. 2. “‘Vengeance is Mine, I will repay,’ says the Lord” (Romans 12:19). Let’s make no mistake, justice will be carried out. If not in this life, God will most definitely bring punishment on these heinous actions in eternity. Even though horrible things like this happen, God will not allow such wickedness to go without consequence. Throughout Scripture God has promised that all sins will have consequences. Some of these punishments came swift (Acts 5:1-11), others were delayed until after death (Luke 16:19-31). No matter when people’s wicked actions are punished, all will eventually be dealt with by God. We can’t know for sure why God allowed this event to happen, but we can know for sure that God will bring these acts to justice. Those who decide to blame or become angry with God have missed God’s clear feelings towards sin throughout Scripture. Ecclesiastes 12:14 states, “God will bring every act to judgment, everything which is hidden, whether it is good or evil.” In these times of tears and broken hearts, let’s take comfort in the fact that justice will be served by God.